As such, after expanding the list of prohibited scrap items twice, China is taking the last step in its plan to completely prohibit the import of solid waste to protect the environment. Once this happens, scrap flows will have to find alternative docks. Vietnam is believed to be a potential destination, because the country still doesn’t have detailed plans to tighten the import of solid waste. Nguyen Huu Nghiep, deputy director of the HCMC Customs Agency, confirmed that scrap imports receive customs clearance if they meet requirements of the environment ministry. Meanwhile, environmentalists have voiced their concern about scrap imports. Le Huy Ba from the Institute for Science & Technology and Environment Management, said it is highly possible that Vietnam would become a “new scrap and waste storehouse” of the world. Though the risk was anticipated more than one year ago, scrap still arrives in Vietnam. A report showed that the volume of plastic scrap imported to Vietnam increased by 200 percent in 2018 compared with the year before, while China and Hong Kong, the two biggest plastic scrap consumers, saw imports fall by 90 percent. “The Ministry of Natural Resources and the Environment must take responsibility for this,” Ba said. More than 20,000 containers of imported scrap have been left at ports because there are no owners. The scrap cannot be re-exported or destroyed. 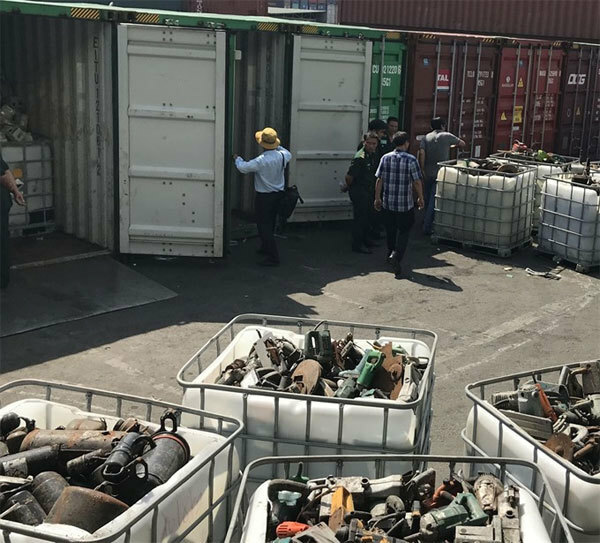 Hundreds of enterprises have been found importing scrap just for sale, and only16 enterprises have been found violating the current laws and have been fined. Pham The Hien, a respected environmental expert, agrees with Ba, saying that when hundreds of scrap containers got stuck at ports, state agencies should have drawn up and submitted to the government a plan to reduce and prohibit scrap imports. They are now still busy building up standards for scrap imports. He said that Vietnam needs to exploit domestic sources before allowing enterprises to import scrap.